Remove zest from the orange and lemon & set aside. Combine orange juice and cold water to equal 3/4 cup. In a small bowl, combine juice/water, oil, yolks, vanilla, and zests. Set aside. Add juice mixture to flour mixture, beating for one minute with electric mixer on medium. Set aside. In another large bowl with clean beaters, beat egg whites with cream of tartar until stiff peaks form. Very gently fold egg whites into flour mixture. Spread batter into an UNGREASED angel cake pan. Bake for 60 minutes. 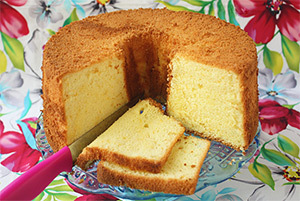 19 Comments on "Citrus Chiffon Cake"
Can I replace the orange juice with lemon juice? My family doesn’t really like orange in their desserts. Thanks! Can you use cake flour ? Have you ever or why not ? 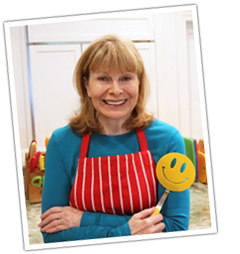 I’m a big fan of you and of your recipes!!! This is the 2nd recipe I have made from your site and the results are fantastic! This cake is so light and airy just like an angel food cake, except its so much better!. I added 2 tbsps of Grand Marnier to the liquid to enhance the orange flavour. It sure did! Was wondering if it is possible to make this in a rectangular Pyrex dish and maybe wrapping the bottom and sides with tin foil to prevent browning? I’m a total baking newbie and live in Asia where easy access to North American bakeware is a bit limited. Probably could get the pan you suggest. Just not available at the local “Wal-Mart” like stores. PS: love love love your YouTube channel. I’m not really sure but I know that chiffon cakes need a fairly tall pan and the sides should never be greased so the batter can stick to the sides and rise up. I think you would have better luck with a loaf pan but you would probably have to do 1/2 the recipe. However, you should still check around for chiffon cake recipes in a cake pan because you may find a different recipe that allows you to use the pan you have. Can I make cupcakes from this formula? Can I add butter into a chiffon cake? because i also want a buttery flavor chiffon cake. should i cream the butter first and add the yolks? I think you can replace part of the oil with butter but from my research, it will not be as light and airy as the version with only oil. I can’t speak from experience but I believe the butter should be melted and cooled and added with the oil. If you try it (either way) please let us know. The french sponge cake called Genoise takes butter and the way to add it is as follows: once you get the egg foam (in this cake this would happen after adding and folding the egg whites) ready and mixed, pick a 1/4 cup of that batter and mix it with the melted butter, than fold it back to the rest of the batter. This is a trick to use butter and still have a lighter cake than just by adding the butter to the wet ingredients and lastly fold in the egg whites. can i replace cream of tartar with baking soda? No, baking soda can not replace cream of tartar. The cream of tartar is only there to stabilize the egg whites but you can leave it out. Just make sure your egg whites are well beaten into stiff peaks. a little bit of salt is an alternative to stabilize your egg whites if cream of tartar is not available. It’s a standard angel cake pan and measures 4 inches tall. The bottom is 8 inches across and the top is almost 10 inches across. Angel food cakes and chiffon cakes should be baked in an ungreased angel food cake pan, which is a tall pan (about 4 inches tall) with straight sides. By not greasing the pan, it makes the batter stick to the sides and rise up and not greasing also keeps the cake from falling out when you turn it over. Most angel cake pans have removable bottoms and small “feet” at the top so when you turn it upside down, it rests on the feet. It should be turned upside down immediately after baking to cool. If the pan does not have feet, place it on a bottle with the neck of the bottle in the open center of the pan.